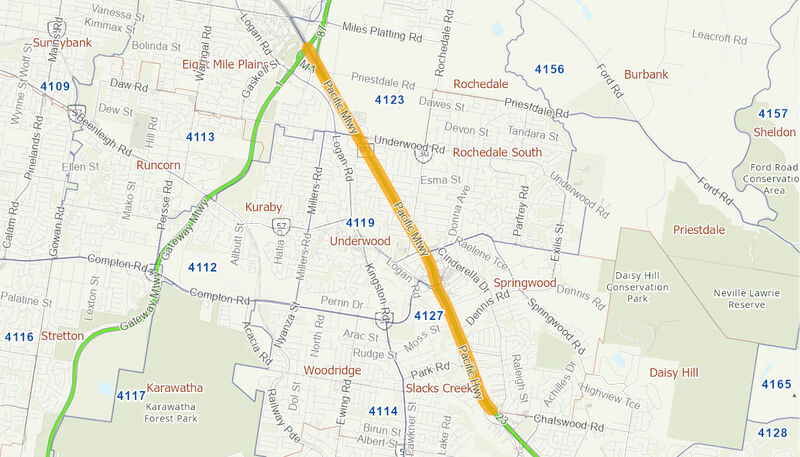 The Australian and Queensland governments provided $77 million, towards planning and land acquisition, for the future upgrade of the Pacific Motorway from the Gateway Motorway to Springwood South and construction of an auxiliary lane from Fitzgerald Avenue to Aranda Street. The Pacific Motorway Upgrade, Gateway Motorway to Springwood South project forms part of the Pacific Motorway Transit project designed to improve safety, transport efficiency and reduce congestion. Construction of the Fitzgerald Avenue auxiliary lane project will reduce travel times, improve travel reliability and increase productivity through transport efficiency on the motorway. The Australian and Queensland governments each provided $455 million, a total of $910 million towards upgrading the Pacific Motorway between the Gateway Motorway and Tugun. Of this $910 million, this project has been allocated $77 million. The Australian Government provided $38.5 million to the project, in partnership with the Queensland Government. Construction commenced in April 2013 and was completed in June 2014.